Let’s take a look at how to use your new Uniden R7, what all the buttons and menu options do, and how to configure your R7 for optimal performance and minimal false alerts. Purchase a Uniden R7 here. This guide is current as of firmware 1.22. You can download the latest firmware here. Uniden continues to update and improve the R7 and as features are added or changed, this guide will be updated accordingly. The Uniden R7 manual is also an excellent resource. This guide will cover additional information, plus I will keep updating it as settings change. Short Press: Create GPS Mark so you get alerted every time you come by this area, useful for school zones, common speed trap locations, etc. 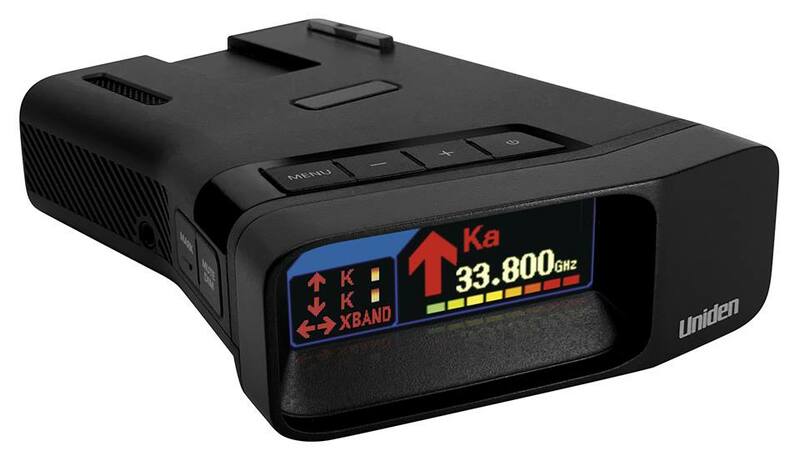 Adjust the sensitivity of the radar detector. Highway: (Default) Full sensitivity on all radar bands. City: K Band sensitivity is dropped to 10%, greatly reducing false alarms at the expense of range. Here’s some Highway vs. City Mode testing. Advanced: Individually adjust the sensitivity of the three different radar bands. Choose between 30% – 100% sensitivity in 10% increments. K Band: A popular choice here is to dial back the K band sensitivity to cut down on falses. Note: Switching to Advanced mode only activates the ability to individual adjust the sensitivity of the different radar bands. It does not enable any other advanced features. Enable the different GPS related features and options like GPS lockouts, low speed muting, redlight camera alerts, etc. The GPS features are incredibly useful so it’s recommended to definitely leave this on. If you turn this off, the GPS-related options will disappear out of the menu. Notifies you when you approach speed cameras. It will also alert while you are above the speed threshold where the camera issues tickets. Note 1: These are GPS-based notifications that come from the downloadable database, separate from radar or laser alerts. The latest database generally comes packaged with the latest firmware. Note 2: These alerts always occur even if the speed cameras only operate at certain times of the day such as in school zones. Notifies you when you approach redlight cameras. Note 1: Like speedcam alerts, these are GPS-based notifications, not radar or laser based alerts. Note 2: The RLC alerts happen whenever you pass through an intersection with an RLC, even if the cameras only monitor one or two directions of travel. Mute redlight camera alerts on nearby surface streets as you’re driving down the highway. This way you only get alerts when you’re driving on slower city streets. Think of it as high speed muting. Here you can select the maximum speed that you’ll still get RLC alerts. Enable voice alerts for radar or laser signals (ie. “Ka Band”), direction (“Front,” “Side,” or “Rear”), as well as for the different menu options. Enable or disable X band detection. X band is actively used in OH and southern NJ, but mostly phased out of the rest of the country. Enable or disable K band detection. K band is actively used throughout most of the country. Enable or disable Ka band detection. Ka is actively used all over the country and when your detector goes off to Ka, it’s almost always a legitimate alert. Enable or disable Laser detection. Laser detection is of little practical value because even if your R7 does go off (and often times it won’t because a laser beam is so thin), the officer already has your speed. For proper laser protection, I recommend pairing the AntiLaser Priority laser jammer with your R7. Enable detection of K band POP detection. This is essentially unused in practice and it’s recommended to leave this off. Detect the MultaRadar CD and CT which are low powered radar guns in use in a few state and provinces in North America. MultaRadar guns are in use in Alberta, Quebec, Chicago, NYC, and in Maryland near Washington D.C. Note: If MRCD/CT is unused in your area, it’s recommended to leave this setting off because you will get false MultaRadar alerts, similar to how you’ll get false K band alerts. Not every MRCD alert is actually a legitimate MultaRadar source and false MRCD alerts from BSM’s or auto door openers can happen. Detect 67ms Ka band POP radar. This form of radar is essentially unused so it’s recommended to leave this off for improved performance and reduced false alerts. Filter out many sources of K band false alerts such as many (but not all) cars with blind spot monitoring radar systems. Filter out false alerts on Ka band. False Ka alerts are rare so people generally leave this off since you typically get better performance with it off, though I haven’t seen any Ka filter tests done yet to confirm. Traffic sensor filter designed to filter out traffic sensors on the sides of some highways that blast K band. If you get repeated K band alerts on your R7 on the highway that aren’t coming from nearby vehicles, turn on TSF. Note: I have also found TSF to be helpful at reducing BSM falses too. Testing has found that there is no delay-based performance penalty with this implementation of TSF so I generally recommend turning this on either way to help quiet the detector down. This is essentially your Honda / Acura BSM filter. Those false alerts are extremely common and extremely difficult to filter out, so Uniden has given us a notch filter to ignore all alerts between 24.194 – 24.204, effectively filtering out Honda / Acura falses. This will also ignore any legitimate radar alerts in this frequency range, but legit alerts in that range are very rare while false alerts in this range are very common so it can be a helpful way to significantly quiet down the R7. Note: A few people have reported occasional Honda / Acura falses even with the filter enabled. I haven’t seen one myself, but occasionally you may see a punchthrough. We’re thinking the K Block filter may actually be like City Mode where it filters out signals unless it’s really strong. We’re still getting familiar with the nuances. This feature was added in firmware 1.22 so if you don’t see it available in your settings, please update to the latest firmware. Adjust the range of frequencies that the R7 scans for on K band. Adjust the range of frequencies that the R7 scans for on Ka band. All of Ka band is very wide so cutting down to a smaller range of frequencies improves the performance of the detector. Segmentation: Choose the individual Ka frequency ranges where you’d like the detector to scan for. Note 1: If you’re wondering where segment Ka 10 is, it’s gone from the R7. To give the R7 the ability to scan down lower on K band, they’ve removed its ability to scan higher up on Ka band. Ka band above 35.600 is virtually non-existent so in general this is a good trade-off. This feature first came on the Net Radar DSP and you can read more about this discussion here. Note 2: Read this post on RDF to learn which Ka segments to enable in your area. When detecting multiple signals, how should the R7 prioritize which signal is treated as the primary signal? The primary’s signal will take up most of the display and the audio rampup beeps will be for the primary signal. Ka: (Default) Alert priority is based on radar band. If you’re seeing multiple signals, alert priority will be given to Laser, Ka, K, & X in that order. Signal: Alert priority is given to the strongest (and likely closest) signal, no matter what frequency or band it’s on. I prefer Ka Priority since legit K band is rare around here. This way a detector alerts me to a weak Ka band at a distance if I’m next to a speed sign. If you have a lot of K band in use, Signal Priority may be preferred to alert you to stronger / closer K band sources. By default, GPS lockouts only apply to X and K band. This makes sense since stationary false alerts coming from automatic door openers and speed signs typically transmit on these two bands. However, if you have fixed false alerts on Ka band (occasionally happens from certain speed signs or even some satellite dishes on homes that transmit on Ka), you can enable GPS lockouts for Ka band as well. Note: Please be aware that locking out Ka band signals can be risky because Ka alerts are almost always legitimate. However, if you are 100% sure that a Ka band source that you keep passing is a false alert, you can enable lockouts for Ka band. Display up to 3 additional signals on the left hand side of the screen, replacing your speed/direction when more than 1 alert is present. Choose unique colors for the arrows, depending on the radar band. By default the arrows are always red, similar to a V1, but you can make them different colors depending on if the primary signal is X, K, MRCD, or Ka Band. Choose the color for when the R7 displays the radar band (X, K, MRCD, or Ka band) on screen. Signal: (Default) The color of the radar band changes as the signal gets stronger, from weak green signals, to medium yellow signals, or to strong red signals. Arrow: The arrow color matches the radar band. Choose what information is displayed on screen when no signal is present. Choose what information is displayed in the left box. Note: This information is temporarily overwritten when you have the All Threat Display option enabled and you’re detecting multiple signals. Choose the signal strength meter style on the display. Alert Display #1: (Default) Signal strength bar is a straight line series of dots under the band and frequency. Alert Display #2: Signal strength is an arc-shaped series of dots on top of the band and frequency. Choose if distances and speeds are displayed in imperial or metric units. If you don’t like the default alert tones for the different radar bands, you can choose between 12 different alert tones. Choose which unique alert tone the R7 plays when it detects a new additional Ka signal while alerting to the first Ka signal. Choose between one of 12 different alert tones for laser alerts. Automatically reduce the volume of an alert after 3 seconds, once it has your attention. If the Auto Mute option is enabled, choose how loud or quiet the detector alerts once it drops down to the auto muted volume level. Note: If your normal audio volume and auto mute volume are the same, it will “drop” to the same level and seem like the auto mute feature isn’t working. Be sure your auto mute volume level is set lower than your normal alert volume. When running the display in dark mode, the display will be off (with a blinking dot that slowly moves along the bottom of the screen to let you know the detector is on). When the R7 picks up a signal, the R7 will light up and display all the normal information (as opposed to the “Off” display setting which keeps the display off no matter what.) This “Dark Mode Brightness” option lets you choose how bright the detector lights up when you pick up a signal. When you have the display brightness set to Auto, you’ll have the option in the menu to choose how bright or how dark the display is in the daytime or at night. Low speed muting for X and K band alerts. This is super helpful around town to keep the detector calm and quiet. Get an alert when you’re traveling above a preset speed. This can be a helpful reminder to let you know when you’re traveling too fast. Select what time zone you are in. Adjust the time for daylight savings time. If you set the time zone, but your clock is off by 1 hour, change this. Alerts you when your battery voltage drops to a low level, below 11v. If your R7 is plugged into a power source that is always on, turn this feature on. This way when you’re parked (stationary) or you’re in a parking garage (so you lose GPS), the detector will shut itself off after 1 hour so you don’t kill your car battery. Plays a sample of the different radar and laser alerts on startup. It doesn’t actually do an internal self-check and it’s more of an audible and visual demo of the different alerts. I prefer turning this off for a quieter and faster startup. Reset all your settings back to factory default. There’s no options here. Pressing the menu button resets your detector. Note: All of your GPS lockouts and GPS user marks will remain in place if you reset your detector’s default settings. Clearing your lockouts and marked locations are in the next menu options. Delete all of your GPS lockouts. There’s no options here. Pressing the menu button clears all of your lockouts. Delete all of your manually marked GPS locations. There’s no options here. Pressing the menu button clears all of your user marks. Note: A shortcut to this option can be found by pressing and holding the Mark button on the side of your detector. This is handy in case you don’t use this feature in the first place and you create a user mark by accident. You can clear your marks this way without waiting until you come back to this location, your detector goes off, and you press the Mark button on the side of your detector to delete that location. The R7 supports 2,000 memory locations, split between GPS lockouts and manual GPS user marks. By default the R7 is set up to give you 1,000 of each. Personally I use GPS lockouts all the time and rarely/never use the GPS marks, so I’d rather allocate the available space to GPS lockouts. In the memory quota section, you can change how many of the 2,000 user points are being used for lockouts or for user marks. You can select up to 1,750 of one which gives 250 remaining for the other, adjustable in increments of 50. In this image, the detector is set to give us 1750 GPS lockouts and 250 GPS user marks. You can also see the number in parenthesis telling you how many GPS lockouts (200) and how many User Marks (100) you’ve created so far. You can change how many lockout and mute memory locations are available with the – and + buttons on top of the R7 and this change will be shown in white text. The bottom text in red stays put as your current/previous settings. Press the Menu button up top twice to change to your new settings. Check which firmware version you’re running. Displays the date of the redlight cam / speed camera database that you’re running. Exit the menu. You can also exit the menu by long pressing the menu button or waiting for the detector to automatically time out. Realistically speaking, there are no one set of settings that are appropriate for every person in every area. If there was, there would be no need to have adjustable settings in the first place. 🙂 Nevertheless, here’s a set of generic recommended settings that you can use as a starting point, think about what is appropriate for you, and then adjust as you see fit. As you drive, you’ll naturally get a better sense of how you can further tweak these settings. Note: The detector is still very new so we’re all still experimenting together to figure out what the “best” settings are. I’ll update these settings periodically as we get a better idea of how things work with the R7. You can also check out this thread on RDF to read other people’s settings. Finally, here’s a look at the settings I use myself. I see almost all Ka band out here and K band is very rare, so I like to be pretty aggressive on the K band filtering. These settings may or may not be appropriate for you and your area, but here’s a look at how I currently run my R7. That’s it for now! Please let me know if you have any questions. If you still need to pick up an R7, you can buy your R7 here. Thanks a bunch!!! I turned K Band down to 30%. Too many K alerts on this R7. Excellent write up! Thank you! Can the settings be done with the unit out of the car. My shoulders are shot and holding my arms up to the mirror to go through all of this is a challenge. So, can the settings be done with the unit connected to a PC? Also, when doing an update, does the unit need 12v car power during the update or does the connection to the PC supply the necessary power to the unit and I can have the unit sitting next to my PC? Thanks for the write up, I’d have just run the darn thing stock. So many questions by old people! Tried it on the PC and no joy. Unit will not power up with just the USB cord. So, to update it to a new software version, I’m concluding it needs to be hooked to a 12v source and have a laptop connected to the USB for updates. I just updated my R7 with just USB power and confirmed the update when I took it back to the car. No need to be plugged into power! So the R7 will fit on the R3 BlendMount? I just wanted to remind you your still #1 your the best your timing for posting this is incredible! I will vote for you for President!!! Thanks – great detailed information. Some have commented that the R7 is so sensitive that it is constantly giving false alerts. Not only would that be extremely irritating, it would largely offset any benefit of the R7’s superior detection range. Do you find that the settings recommended above minimize false alerts to a level expected of most higher end dash mount detectors? I do still find it relatively chatty and have been progressively experimenting with more and more aggressive filtering settings to find a good balance. How do I adjust for the chosen segmentation 2/5/8? Which buttons to press once at ‘segmentation’? Switch from Ka Wide or Ka Narrow to Ka Segmentation. Then you will see the options show up afterwards to select which segments you want. When do you plan on spectre testing the r7? It won’t be able to for a few weeks. Someone on the forums might be able to do it sooner if you need to know now. When driving and when showing just my speed option on left side of the oled screen… it says SPEED above my speed (mph) in white lettering.. mine keeps going in and out. It will say Speed for about 5 seconds or more and other times it’s just the color green with no words. This happens when driving and when just sitting idle, it doesn’t matter. Would you see if yours does that? Just when you get a chance. I feel like it should always say speed and that mine has a glitch but want to make sure before I even start that process. Or it is there to keep the letters from ghosting into the oled, so the word blinks sometimes. It’s intentional to help avoid screen burn-in. 1) Despite meticuously following your excellent firmware on a Mac video I always get “no usb cable connected” error. Upon first insertion the port felt way too tight. Thinking a defective port. Ideas? 2) Since I cannot mount any detector in the center of the windshield die to Subaru’s “Eyesight” system I was thinking upper driver’s side corner. Visible and easily removed if need be, like when a cop does pull you over. Thoughts? Did you install the drivers for your Mac? Yes. All installed and permission granted per your video. Keep getting a “No USB cable” error. First cable insertion was hard. Did not fit. Gentle pushing snapped it in. I keep suspecting the port. That’s weird, I’m not sure. I did it and it worked for me and so I don’t know much beyond that. I had the same issue on my Mac.. I found that I had to delete everything and start over. I then made sure the detector was plugged into USB port before I downloaded and installed the software.. It then asked me to change permission when it installed and it work great. Hope this helps. Hi Vortex, You are the best. How’s the suction cup for the R7 ? Should I be worry about it falling off the windshield? It can happen so make sure your suction cups and windshield are both clean first. Then once you stick them on, they should work fine. Any idea if a clip visor mount will be available? Use these for a V1. Find them more convenient than suction cups, which can fail. I see there is a firmware update. Going to check. It is available once you update to firmware 1.22. Vortex, You are amazing. Your videos, blogs and commentary are full of great information. I just received my Uniden R7 and can’t wait to see how much better and hopefully quieter it is than my V1. FYI, I had trouble getting my R7 connected to my PC and Mac with the USB cord. Turns out I got a bad USB cord. I tried several other cords I have-don’t we all have a bunch of them from over the years of owning electronics-anyway, one of them worked fine. Oh yea, I meant to say I purchased the R7 based on your videos etc. Cheers! Is Uniden going to release a remote head sorta like V1 has with arrows and mute for the R7? Just switched from R to R7 K Band False alerts everywhere something is wrong anyone having same issue? Is it possible I am getting false K alerts because MRCD is on?